Location: Lisnaskea, County Fermanagh, Ireland. 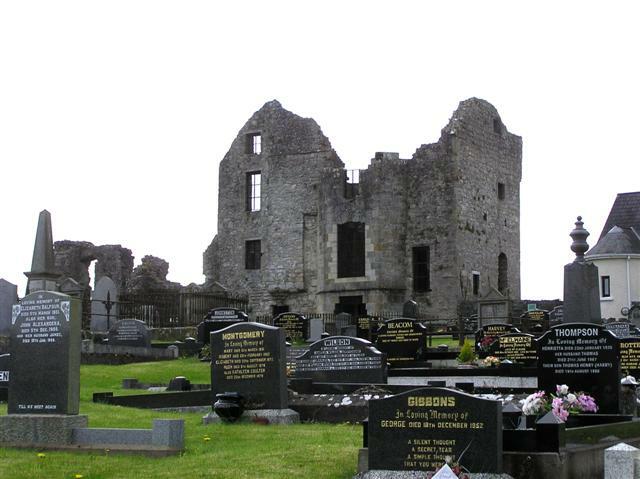 Notes: Castle Balfour is a castle situated in Lisnaskea, County Fermanagh, Northern Ireland. It sits at the edge of the parish graveyard just west of Main Street. The castle is a State Care Historic Monument sited in the townland of Castle Balfour Demesne, in Fermanagh District Council area, at grid ref: H3622 3369. In 1618/19 Captain Nicholas Pynnar reported that Balfour had 'laid the foundation of a bawne of lime and stone 70 ft square, of which the two sides are raised 15 ft high. There is also a castle of the same length, of which the one half is built two stories high and is to be three stories and a half high'. Castle Balfour was a long, rectangular three storey building, on a north-south axis, the main block being 26m by 8m. It had a square wing to the east and west and a later rectangular block on the northern end. It has the style of a Scottish castle and the building is thought to be the work of Lowland Scots masons. The surviving castle is in a T plan with an entrance with gun-loops. The castle has vaulted rooms and a kitchen with fireplace and oven on the ground floor, main dwelling rooms on the first floor and corbelled turrets with gun slits.